With the US market becoming an attractive destination for Chinese tech IPOs, it is worth revisiting the relative valuations of Chinese tech companies versus their US counterparts. I have chosen to compare three US tech companies with their closest China counterparts. The primary two valuations metrics I will focus on are Enterprise Value (EV) / Revenue and EV / Net Income [note]Many blog posts focus on valuing the market capitalization of a company however this assumes the company is financed primarily through equity, market capitalization based valuations can become very misleading for companies with significant amounts of debt financing or that have large cash balances. Enterprise value gives a much more complete picture of a companies’ valuation as it accounts for both debt and cash balances. In mature businesses (such as Microsoft or Intel) EV / Net Income is the primary multiple used in valuations. However young tech companies which have yet to achieve profitability or companies (such as Amazon) that are run at break-even will not have significant Net Income and as such Revenue can be used as the denominator. Both have a large cloud businesses, although AWS is a much more mature business than Alibaba Cloud at of 10x the revenue and is generating $2.5B of operating income whereas Alibaba Cloud is still loss making. Alibaba has an online finance business – Ant Financial [note]Alibaba’s has no direct ownership of Ant Financial. Instead, Ant’s primary shareholder is Jack Ma and Alibaba has a complex arrangement whereby it is entitled to a third of any IPO proceeds and half of Ant’s profits[/note] , whereas Amazon has no corresponding finance business. Nevertheless, they are both are the dominant eCommerce players in their respective markets. In terms of profitability Amazon has consistently operated at breakeven whereas Alibaba’s net margin is close to 30% [note]As noted above this is partly due to Alibaba outsourcing its unprofitable logistics operations[/note]. As such the relevant valuation metric is EV/Revenue which is 3.1 for Amazon and a whopping 17 for Alibaba. Alibaba core metrics are stronger – it enjoys higher gross margins (63% vs Amazon’s 36% [note]This is primarily due to marketplace’s having higher margins that direct sellers of the products[/note]) and is growing at close to 60% versus Amazon’s growth of 30%. Neither of which can fully justify the massive difference between the two valuations. The average eCommerce company is valued at under 3x revenue, and the closest valuation in my dataset of 150 tech companies is that of Atlassian which trades at 16x revenues. Atlassian is considered a best of breed Saas which are always valued at a premium to eCommerce companies due to their revenue quality (Atlassian enjoys gross margins of over 80%). It is heard to find any tech company with a valuation comparable to that of Alibaba, and this is in spite of its opaque ownership and accounting. Whilst Google’s EV of $625 billion dwarfs Baidu’s $70 billion valuation they operate similar businesses, albeit of different scale, as both derive the majority of their revenue from search based advertising. Google’s business looks by far the more healthy – both have similar net margins at approximately 25%, Google has a marginally higher gross margin (60% versus Baidu’s 50%). However, crucially Google is able to grow it’s revenues at 25% despite its higher base whereas Baidu’s growth has flat-lined and is currently a meager 6% per year. Baidu’s prospects also look limited extremely limited – it has virtually no international presence and is not expected to be able to grow beyond China. Within China it’s share of digital advertising has been shrinking and currently stands at 17% and was overtaken in 2015 by Alibaba (which also blocks its Taoboa and Tmall listings from appearing in Baidu’s earch results). 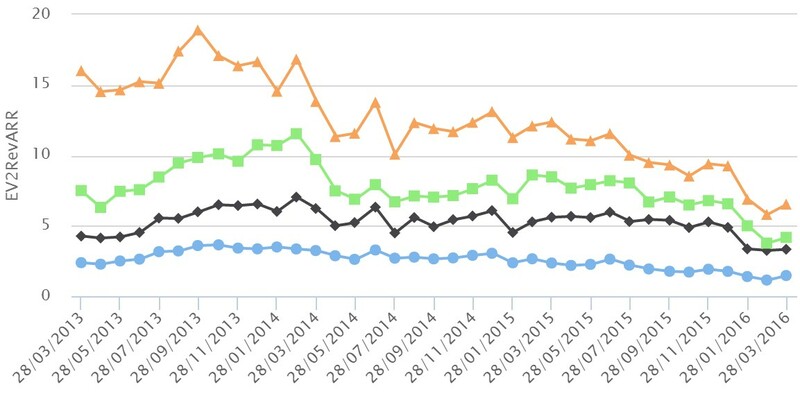 Google by contrast is maintaining its >50% market share of US search. Despite these very divergent businesses, the valuations look very similar – Google is valued at EV/Revenue of 6 (vs 6.3 for Baidu) and EV/Net Income of 30 (versus 27 for Baidu) and thus Baidu’s valuation looks extremely expensive when compared to Google. Both Expedia and Ctrip are both OTAs (Online Travel Agents) which provide distribution for hotels and airlines. Ctrip is the largest OTA, with Expedia the largest US player. In terms of profitability for Ctrip and Expedia both have gross margins of approximately 80%, however, Ctrip is the more efficient able to capture nearly 10% net margin compared to Expedia’s 4%. Growth for Ctrip is stronger at 46% versus Expedia’s 20%. Ctrip thus deserves to be valued at a premium to Expedia, however it trades at nearly double the EV/Net Income ratio (70 for Ctrip vs 40 for Expedia) and 3 times the EV/Revenue ratio. In all three instances the China company is valued at a substantial premium to its US counterpart. The valuation premium combined by the clamp-down on backdoor listings in China as well as the large IPO backlog and an time to approval of close to 18 months will likely result in a surge of China based IPOs in the US from 2018. Mount Parker Ventures has just published its first Asian Venture Capital review. The report reviews the major trends in Asian VC such as the geographic and sector sizes, round sizes and company valuations. With the tech funding market’s shift in focus from revenue growth to profitability as come a lot of confusion on which measure of profitability is a suitable benchmark for tech companies. Revenue less costs directly associated with delivering that product/service. The costs are relatively straightforward for physical goods (ie the cost of originally purchasing the good and then delivering it to the customer) this is a little less clear for tech companies providing a service. The cost directly associated with the sale are then the allocated cost of the servers and infrastructure as well as the full cost of support staff. Why its Important: Gross Profit is the single most important profitability measure for tech companies and gross profit margins (gross profit / revenue) should typically be above 50% for an eCommerce company and above 60% for Saas or digital media companies. Low gross margins businesses may still be viable but they struggle to grow at the rates that VC’s or markets demand as they do not have enough residual margin to pay for a large sales effort. This is not found on an Income Statement and should be treated with caution. The contribution margin is revenue less variable costs divided by revenue, although the precise definition varies from company to company since there is no agreed upon standard. The only difference with gross profit margin is that contribution margin excludes fixed costs and so it will always be higher than gross margin. For tech companies this will typically be the depreciation of the hardware (usually servers) which delivers the service. Depreciation is essentially the apportioned cost of hardware required to deliver the service and ignoring it gives a distorted view of profitability. Gross Profit less expensing incurred in normal business operations such as sales, marketing and admin expenses. Few tech companies under 10 years of age generate any meaningful operating profits. Marketplaces and digital media companies tend to run at around operating profit break-even. Saas companies usually run around -15% operating profit margins since Saas revenues don’t reflect the lifetime values of their customers. Operating profit less non-operating expenses sure as interest payments, one-off charges and tax. Typically for tech companies this is similar to operating profit. All profits should eventually manifest as cashflow (that there is a different at all is primarily due to accounts being prepared under the accruals concept which allows companies to recognize revenues when they are ‘earned’ but not paid). The two most useful measures of cash flow are Operating Cash Flow which is the cash generated from ongoing business operations and Free Cash Flow which is Operating Cash Flow plus capital expenditure. For tech companies Free Cash Flow is the more relevant measure as capital expenditure (primary on hardware such as servers) should usually be considered necessary ongoing expenditure. High negative free cash flow relative to revenues or to cash balance are a warning signal and cannot be sustained for long periods. It should be noted that many public tech companies (notably Twitter) operate at cash flow break-even but record large net profit loses. The core reason for this is the accounting requirement to expense employee stock option grants which reduces profits but has no impact on cash flow since option grants involve no cash outflow. These are all ad-hoc measures created by companies which claim to give a truer picture of their profitability and should all be treated with extreme caution. There can be significant insight gained from adjusting GAAP accounting earnings — in Saas businesses for example revenue could expanded to account for some of the customer’s lifetime value. However, this should be done conservatively and consistently applied across different companies. Relying on companies’ own measures of adjusted earnings is fraught with danger as there is no common definition for the measures and companies often cherry-pick which items to exclude to flatter their earnings. The recent travails of Lending Club have shone a not-so-flattering light on FinTech startups. On the surface, the finance industry replete with large slow-to-innovate institutions appears ripe for disruption. However, the performance of the recently public FinTech companies shows that finance make not be as easy a target for disruption as FinTech companies have made out. In this article I will focus on the the lending space which has seen the most turmoil in recent months. 2015 saw the debut of two lending companies on the public markets — namely Lending Club and OnDeck. Lending Club is a marketplace for personal small loans whereby the loans are on-sold to investors. OnDeck, by contrast, focuses on small businesses and utilizes its own balance sheet to fund the loans (although it also runs a small marketplace) and so more closely resembles a traditional bank. The core proposition by the lending startups is that banks, who typically prefer loans under $15k to be done via credit card debt, have served the small loans market poorly. Furthermore, risk analysis can be done more efficiently and accurately using algorithms. FinTech lending companies are heavily dependent on consistent and stable sources of funding to back their loans (marketplaces such as Lending Club require investors to purchase the loans whereas on-balance sheet lenders like OnDeck require banks to finance their lending). The market turmoil of 2015 and 2016 has clearly demonstrated that these sources of funds are highly unpredictable — Lending Club is now having to warehouse loans on its balance sheet as it is unable to find counterparties willing to purchase them. Likewise, OnDeck which had previously planned to offload 40% of its loans was only able to offload 15%. Thus, despite efforts to broaden their funding base, both OnDeck and Lending Club are having to rely on traditional institutional (mainly bank) funding to fund their loans, the withdrawal of these lines of credit could pose an existential risk for the companies. Tech startups often endure several public setbacks such as security breaches or privacy violations. These are often swiftly overcome and forgotten and the company progresses. Not so for finance companies where infractions can lead to a loss of confidence and a withdrawal of funding. Lending Club’s changing of the dates of $3m of loans (out of a total of ~$3bn loans originated) as well as the CEO’s undisclosed shareholding in a related party have proved so serious that the firm has not only removed the CEO but cannot provide earnings guidance as there is so much uncertainty regarding the fallout. FinTech lending companies trumpet the sophistication of their risk analysis technology, however, this is essentially a black box and it is impossible for investors to evaluate until the company has gone through a complete credit cycle as credit risk assessment can be flattered by an overall macro environment strong credit (as is the case in 2016, demonstrated by the below chart). All this naturally leads to how should FinTech companies be valued. There’s been considerable debate on the subject of FinTech company valuation — should they be valued as typical finance companies or tech companies? The issue has a massive impact on valuations since tech companies tend to be valued on a multiple of revenue (typically around 4x for Saas companies), whereas finance companies tend to be valued using a multiple of their net assets which usually gives a far lower valuation. Tech company revenues are relatively stable (it is usually the level of growth which causes uncertainty). This is because there is usually some degree of lock-in for tech companies’ customers — with social media companies it is the network of friends/colleagues, for Saas companies it is the customer’s investment in time to adapt to using the product and the difficultly in migrating to a rival product. None of this applies to FinTech lending companies whose customers can easily move to alternative platforms. Tech company margins tend to be predictable and manageable. The costs of delivering a tech product or service do not swing wildly and so gross margins can be forecast and managed. Not so for FinTech lending companies who are at the mercy of the vicissitudes of the economy which determines interest rates, demand for loans and default rates all of which have a direct impact on gross margins. Despite all of this, the market is still focused on revenue as the primary driver of valuation although this is likely to change as the companies mature and the market’s approach to valuing tech companies evolves. In a previous article I discussed the declining importance of revenue growth in setting valuations, the question that now needs to be asked is what factors are now driving valuations and what the remainder of 2016 holds for tech valuations. A conundrum in understanding the recent selloff in stocks (and the associated compression in tech valuations) is how indiscriminate the mark down valuations was. Aside from the reduced premium for high growth companies little attention appears to have been paid to companies’ internal fundamentals (such as profit margins or cash flow). As such, regardless of what measure of profitability is used there remains no correlation between valuation and profitability for Saas companies (or for Social Media/Digital Media companies). I prefer to view the recent market repricing as the first stage in a two stage process. In the first stage (which appears to have been completed) all valuations are written down in a sharp market adjustment with little regard being paid to the individual companies’ fundamentals. The second stage of the repricing is a more gradual reassessment of the merits of each company. So the key question is what metrics will the market focus on in future for valuing tech (and more specifically Saas) companies. The end goal of any business is (or should be!) to generate profit. There are two primary measures of profitability to focus on — gross profit (revenue less costs directly tied to producing the good/service) and net profit (gross profit less other costs such as marketing or R&D). Gross profit margin is sometimes fashionably referred to a ‘unit economics’ as is the first measure of profitability to assess — after all if a firm cannot even sell a product for more than its cost its prospects are bleak. Recently, there has been extensive discussion on incorporating ‘unit economics’ into private market valuations and expect for this to be mirrored in the public markets. Thus in the short to medium term look for an increased correlation between valuations and gross profit. Net profits tend to be a long time coming for tech companies and especially so for Saas companies (as they cannot recognize the full value of new customer in their revenue figures). Seeing a correlation between valuation and net profit for tech companies is still a long way off. Cash is the fuel that all companies run on and so a negative cash flow can only be sustained for so long. Companies that run persistent free cash flow deficits are likely to be heavily punished by the markets. There is some evidence that this is already happening, Box has seen its value cut in half since its IPO despite healthy gross profit margins of 70% and growing revenue 10% per quarter. Box’s free cash flow to revenue ratio is -0.47, meaning that for every dollar of revenue it looses 50 cents in cash. To compound this, Box can only sustain this level of negative free cash flow for less than 18 months before it will need a cash infusion. The major impediment in converting revenue into profit is operational efficiency — ie what levels of costs relative to revenue does it take to maintain the business in its current state. Two useful benchmarks of operational efficiency are revenue per employee and Sales/Marketing/Admin expenses to revenue. If cash flow and profits are to be a factor in valuation it therefore follows that measures of operational efficiency will affect valuation. 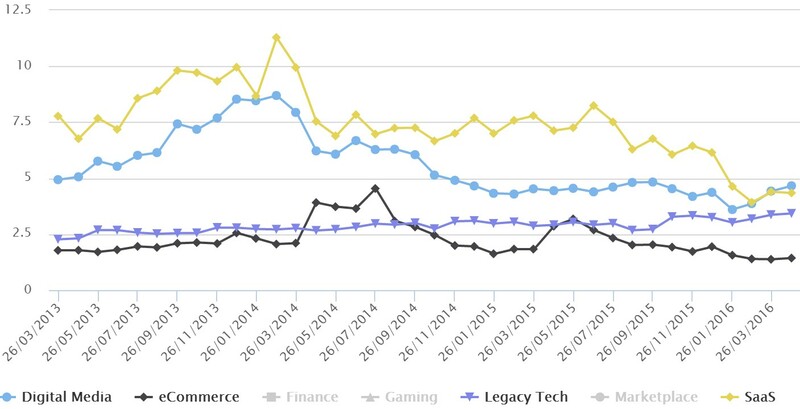 A notable feature in the early 2016 tech stock selloff was the resilience of legacy tech companies (ie mature tech companies whose growth has plateaued and are generating profits such as Oracle, Microsoft, IBM). Since 2014 the Enterprise Value/Revenue ratio of legacy tech companies has steadily increased whilst that of Saas companies more than halved. To recap the first post on the Great Compression in Tech Valuations there are two related trends in EV/Revenue for Saas companies over the past three years – the overall decline in valuations (ie EV/Revenue ratios) and the clustering of valuations around the average (so it is increasingly unusual to be able to achieve a valuation far higher than the average). These two trends are actually closely related with the driving force being the premium the market has placed on high revenue growth companies. The market used to put a very high premium on Saas companies which were able to achieve high levels of revenue growth (ie greater than ~10% per quarter). This is best examined by looking at regressions of Revenue Growth vs EV/Revenue since March 2013 (a regression will show the strength of the relationship between Revenue Growth and EV/Revenue , with the ‘slope’ of the regression being the change in EV/Revenue per unit of change in Revenue Growth). The below graph is the monthly slope of the regression for EV/Revenue vs Revenue Growth. Note in the graph the slope units are in 1/100th of a percentage point so a slope of 100 would mean each 1% increase in Revenue Growth results in an increase of 1 unit the EV/Revenue ratio. At its peak in September 2013 each percentage point increase in quarterly revenue growth would be rewarded with an increase of 1.4 in the EV/Revenue ratio – thus in Sept 2013 LogMeIn with revenue growth of 5% had a EV/Revenue ratio of 4, whereas Tableau Soft with growth of 15% had a EV/Revenue of 20. By March 2016 the slope was down to 0.36 so each percentage point of growth is worth a mere 0.36 in the EV/Revenue ratio (for example MobileIron which is growing revenues at 4% has a EV/Rev ratio of 1.7 whereas the faster growing New Relic which is growing at 13% and has a EV/Rev ratio of 6.1). The decline in the premium for high-growth companies has primarily affected the top quartile of fast growing companies. 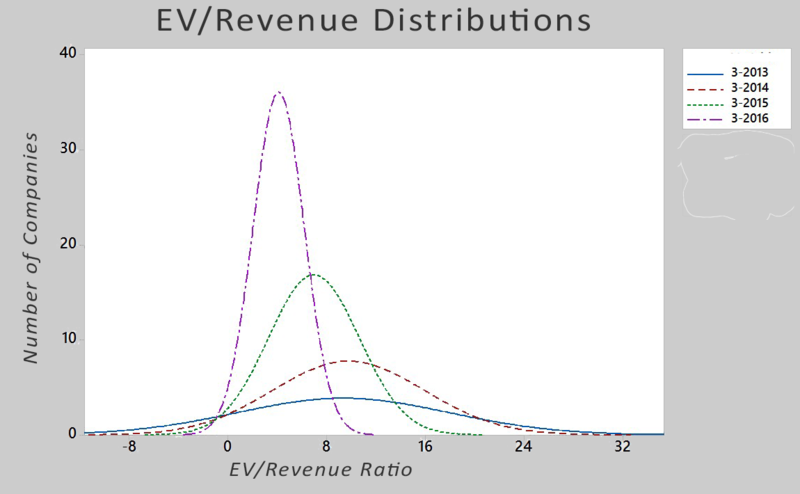 The below graph shows Saas EV/Revenue ratios divided into revenue growth quartiles with the highest growth companies attracting the highest EV/Revenue ratios. Note the greater decline in the valuations of the fastest growing quartile of companies which converged with the slower growth companies, reducing the valuation differential and dragging down the overall average. Why Did the Market Fall Out of Love with High-Growth Companies? As explained in detail by Joseph Floyd, Saas valuation compression is simply a reversion to the mean after valuations diverged from other tech companies in 2012. But was the cause of the divergence and subsequent reversion? As I see it there are three possible explanations for this – although it is difficult to assess the validity of any of these. The number of Saas public companies for investors to invest in has grown from approximately 10 in 2012 to 40 in 2016 (depending on your definition of Saas of course..). Investors looking for exposure to Saas have more options for companies to invest in. General market risk appetite has declined. Since mid-2015 the S&P High-Beta index has under performed the broader index as investors rotate into less risky companies. Saas companies which typically are young and have minimal profits would certainly be considered as high-beta or risky assets. Failed promises of public Saas companies. Public Saas companies have in general failed to deliver on profits and in several cases such as LinkedIn the growth trajectory has leveled off earlier than expected. It is important to note that this is a big reason that private companies can have higher multiples than their public counterparts as they are very often growing faster and so should have a higher multiple. In this series of posts I will examine the compression in tech valuations (as measured by the Enterprise Value/Revenue ratio).In this first post I will take a look at what exactly happened and look a little beneath the surface at some of the underlying trends. In the second post I will focus on the causes of the upheaval in valuations and finally in the third post I will look to the future and highlight some of the possible and probable valuation trends for the remainder of 2016. The received wisdom for tech company valuations, especially young fast-growing companies, is that they should be valued on a multiple of revenue. There are two primary reasons for this, firstly fast growing tech firms rarely have any significant profits (and so ratios such as Price/Earnings or multiples of Net Income will not be useful). Secondly, revenue is a relatively ‘clean’ metric as it is less prone to manipulation and earnings management than figures lower down the Income statement such as Net Income or calculated metrics such as EBITDA. I will examine other valuations methods and metrics in a future article but for now the primary metric will be the Enterprise Value to Revenue ratio. Enterprise Value (EV) takes market capitalization as its starting point and then adjusts this for the firm’s debt and cash balances to get a more comprehensive valuation (for a more detailed explanation, please refer to Damodaran’s overview of valuation methods). The compression in the Enterprise Value/Revenue multiple has been extensively documented but just for completeness note the below graph with shows the median EV/Revenue ratio for Saas companies declining since 2013 from a high of 11 in early 2014 to a low of 4 in February 2016. Despite the recent proliferation of blog posts about the ‘Great Compression’, the trend is the trend is not new – the peak in valuations was in early 2014. Most of the commentary on this compression in valuation ratios has focused on Saas companies, so it is worth looking at other tech sectors. The below graph shows the ratios for Digital Media (Google, WebMD, Yahoo, Pandora), eCommerce, Marketplaces and Legacy Tech (comprising mature tech companies such as Microsoft, Oracle and Computer Associates). There are a few interesting things to note here. Firstly, Legacy Tech has been immune to the trend of valuation compression with its valuation ratio actually increasing from 2.2 in early 2013 to 3.4 in March 2016. 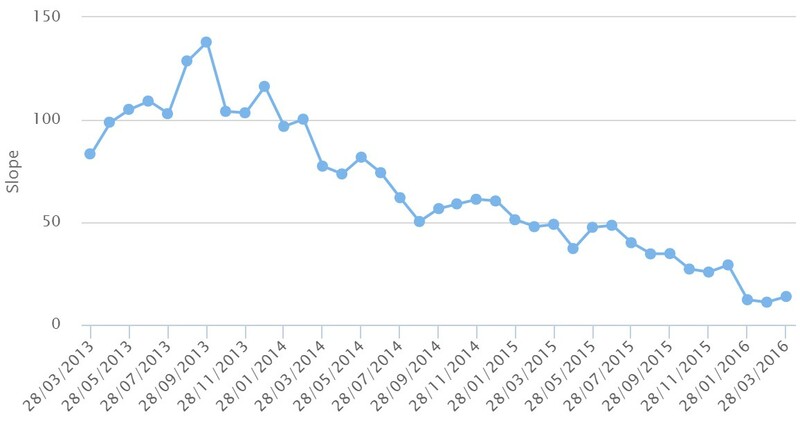 Digital Media, eCommerce and Marketplaces ratios have all peaked from Dec 2013 to Dec 2014 and suffered declines since. eCommerce companies have the lowest valuations with the median EV/Revenue ratio at just 1.4. Before examining the reasons for this compression we can take a closer look at the individual valuations within the averages, in particular the range of the valuations. In March 2013 there was a wide spread of EV/Revenue valuation ratios for Saas companies ranging from 2.75 (for LifeLock) to 31 (for Workday). By March 2016 the range was from 1 (Bazaarvoice) to 11 (Workday). This can be better illustrated by using fitted normal distributions for different time periods (these distribution curves show frequency for different values of EV/Revenue). The graph below shows the distributions on March each year starting 2013. The graphs graphically illustrate the decline in the average value for Saas EV/Revenue multiples (note that the average is the peak of each graph which has consistently shifted lower – it to the left) more notably the distributions are more compact with March 2016 showing most companies clustered around the mean EV/Revenue of 4 versus the very spread out March 2013 distribution. EV/Revenue ratios for Saas, Digital Media and eCommerce companies hit their peaks in 2014 and have been declined since. Legacy Tech companies (such as Oracles) have seen the valuations ratios steadily increase (albeit from a low base). eCommerce companies continue to attract the lowest valuation ratios. Individual company valuations are now more tightly clustered around the averages with far fewer outliers. In the next post I will examine the causes of the compression in valuations. When and how much revenue to recognise in a firm’s accounts is one of the most contentious and important issues in financial accounting. The issue is especially acute for tech firms since early-stage tech firms may not yet have reached profitability, thus revenue and revenue growth will be key financial metrics. In addition, technology firms often sell intangible products and services which can be more difficult to determine a revenue for. The first thing to note is that there is no clear-cut consensus on revenue recognition, there are only a set of broad principles which need to be applied. The overarching rule is that revenue should be recognised in a firm’s accounts only when a valid order has been received, there is a strong likelihood of receiving payment and the product/service has been delivered. The relevance of a valid order is relatively simple – a firm must have received a product/service order if it is to consider the revenue earned. Firms will sometimes ship products to potential customers in anticipation of an order, if the potential customer does not wish to keep the product they can return it at no cost. In this scenario, shipping the product is done without a purchase order and there has clearly been no valid sale and no revenue should be recognised. In the digital world, a close relation to shipping in advance of an order this would be free trials of an online service which entail no obligations from the user and no revenue should be booked for these. To recognise a sale as revenue the full payment does not need to be received but an assessment must be made about the likelihood of receiving the payment. If it is likely that a payment will be made then the firm may book the sale as revenue. For example, an app purchase on the Apple App Store can be booked as revenue immediately despite the fact the the funds will not be received for one month. The delivery of the product/service is usually the area when most confusion and disagreement arises. If there is a physical product then it could be considered as delivered when it is delivered to the customer or when it is shipped (either dispatched from the firm’s warehouses or, more conservatively, when received by the customer). Delivery of digital goods is more difficult to define. For a software application, the customer must have taken dilvery of the application and accepted it. However, for more digital products such as software applications, the product itself is not the sole deliverable. Typically, there is support, training and upgrades included with the purchase. In such circumstances the firm must make an assessment of the fair market value for each of the bundled services and only recognise the portion of income associated with each element when it has been fully delivered. Microsoft’s earned revenue reflects the recognition of the fair value of these elements [ie the individual components of the order such as upgrades and technical support] over the product’s life-cycle. The payment received for the product which has not yet been recognised will be held on the Balance Sheet under ‘Deferred Revenue’. For example, if a software firm sells a software application including one upgrade in a year’s time for $100 and it is determined that the value of the upgrade is $20 then the firm will show the $100 in its Bank/Cash on the Balance and $80 in Revenue in the Income Statement, the balance of $20 will be in Deferred Revenue on the Balance Sheet. In one year’s time when the firm’s obligation to deliver the upgrade has been fulfilled then the $20 in Deferred Revenue will be removed and $20 will be added to Revenue. Note that this type of accounting is appropriate for vendors selling pre-built software applications. For vendors selling software development services such as third-party app developers, a contract method is appropriate whereby the revenue is recognised on a percentage-of-completion basis. Digital goods represent an accounting challenge as there is often no real-world analogue. Deloitte, although not a regulatory body are the auditors for many vendors of digital goods such as Zynga and issued a detailed guideline on digital goods accounting. In general, an assessment should be made on the period over which the good will be used. Revenue will then be recognised over that lifetime. A key issue with this is that the firm itself is responsible for estimating useful lifetimes and this estimate is difficult to test or evaluate since the data used will be internal to the firm and not publicly available. Subsequent changes in these estimates will directly impact the firm’s Revenue and earnings, for example Zynga has repeatedly reduced the estimate of the months a player will play its online games, this in turn reduces the lifetime of the digital goods the player purchased and essentially accelerated the recognition of revenue. A sale of a $30 book by Amazon will create $30 of revenue for Amazon, whereas a $30 book sale by eBay will only create approximately $1.5 of revenue for eBay*. The difference is that Amazon is consider the principal in the transaction whereas eBay is an agent. The seller is considered the principal if it takes ownership of the product, establishes the sale price, assumes the risk of collecting payment from the customer and processes. The principal can recognise the full sales amount as revenue. Otherwise the firm is considered an agent in the transaction and may only recognise the commission or agency fee for the sale. For this reason Groupon was required to restate its revenues in its financial accounts. Groupon’s direct sales business offers goods and services at substantial discounts, orders placed on its website are routed to third-party vendors who are then responsible for dispatching the goods and handling returns. Groupon initially booked the entire sale value as revenue but was forced to restate this and only recognise its commission for each sale since it did not take ownership of the products prior to sale. An important issue to consider for both physical goods and for services, is the rights of return/cancellation. If there is a right of return or cancellation then revenue can still be recognised provide the sale price is fixed, the buyer is still responsible to pay in the event of theft or destruction of the product and most importantly that the returns can be estimated. Thus the firm should have some history of returns and estimate a percentage of returns, this percentage should then be used a provision on the Income Statement (thus the full amount of the sales would be recognised as revenue and a provision for returns then deducted as an expense further down the Income Statement). As always, there is a potential issue when a firm makes estimate using internal non-public data (in this case returns/cancellation rates). The provisions are frequently insufficient or can even be used to smooth earnings over time – largers than necessary provisions can be make during good periods and subsequently reversed during lean periods. This is clearly a simple format and for this reason XML based formats have become popular across a wide range of applications, since Office 2007 both Microsoft Word and Microsoft Excel use XML based formats (.docx and .xlsx respectively). However, despite the promise of an easily consumable format for financial reporting data, XBRL is deeply flawed and has several major issues. XML is very useful for representing basic data structures, however as the complexity of the data structure grows the XML file(s) becomes extremely large and unwieldy. A set of company financial reports is a large and heavily structured set of data and so the XBRL files to represent them is very large. For a single quarterly financial report there will typically be at least six interlinked documents which will in total be about five times the size of the PDF. XML has never been a performant data format, even for simple data structures, however it becomes incredibly sluggish for heavily structured data. To read and parse and single XBRL document took a dual-processor server between 50 to 80 seconds. There are a multitude of optimisations which could be applied but none are going to be sufficient to enable scaling and compete with database access times which are measured in milliseconds. Thus, for any serious financial analysis we will need to develop a database schema and first read the XBRL document into the database which will then be the source of all analysis queries. Many of the elements for the XBRL specification were directly ported from the regulatory reporting requirements. The reporting requirements are sufficient for human analysis of financial reports but perform very poorly when translated into a data format to be consumed by software applications. When reading financial reports it is very obvious which figures relate to the current reporting period. However to determine this for an XBRL document is not nearly so easy. For any given line item such as Revenue there are numerous Revenue items which relate to various periods and business segments, only one of these elements relates to the firm’s current Revenue for the actual period and determining which is error-prone. For starters, XBRL does not define the start and end dates for the current period and some companies use non-standard dates (for example Apple ends its reporting periods not on the last day of the period but the last business day). Thus to extract the actual reporting elements related to the current period some relatively convoluted (and hence error-prone) code logic is required. In financial reports a zero balance is often not required to be reported. This works fine when reading reports but for a data format it is not very robust. For example, there is no debt on Apple’s Balance Sheet so the Debt elements are simply not included in the XBRL document. If we read the data into an application and attempt to calculate a metric which uses debt as an input an error will be thrown since the Debt element is simply not found as opposed to being found and having a zero balance. Thus, a zero balance will need to be programatically substituted when no element is found but this is definitely not robust (for example, we would like to know if an element could not be read properly for the XBRL doc and so was excluded for this reason). A major omission from the XBRL spec is non-financial data which is often crucial for an analyst. For example, Apple includes unit sales (eg number of iPhone sales) in its reports but not in it XBRL filings. The above issues pale into insignificance when compared with the minefield of XBRL taxonomies. The XBRL taxonomy is basically a template for the tagging and structuring various items which comprise a financial report. XBRL allows firms a lot of latitude in selecting and even creating taxonomies, as well as changing taxonomies between reporting periods. Taking Apple again as an example, up until 2010 it reported its Fixed Assets using the XBRL tag aaplPropertyPlantAndEquipmentAndCapitalizedSoftwareNet , from 2011 it changed to using us-gaapPropertyPlantAndEquipmentGross. There was no notification of the change or mapping information so software parsing the two documents would not be able to associate the items as being the same balance for different periods. The differences between XBRL documents of different companies is even greater, making financial comparisons between companies almost impossible. The above issues (and especially the taxonomy issue) means that the manual intervention is almost always necessary original promise of XBRL to allow fully automated data analysis still unfulfilled. What is ‘Cash’ on the Balance Sheet? Cash on hand and cash flow are key indicators of financial health for any company, especially for young companies which are vulnerable to cash shortages. Although it would seem to be a straight-forward balance to assess and interpret, the cash balance is frequently misinterpreted and manipulated. The cash balance reported on the Balance Sheet is the cash in the bank adjusted for payments and receipts that have not yet cleared. Therefore, the cash balance on the bank statement will have cheques written by the firm but not yet cleared deducted and cheques received but not yet cleared added to the balance. Cash Equivalents are frequently added to Cash on the Balance Sheet. Cash Equivalents are money market securities with maturities under 3 months such as Treasury Bills. If the maturities are over 3 months then they should be included in Short Term Investments. .. all highly liquid investments with a maturity of 90 days or less at the time of purchase to be cash equivalents. The Company considers funds transferred from its credit card service providers but not yet deposited into its bank accounts at the balance sheet dates, as funds in transit and these amounts are recorded as unrestricted cash …. Note the second sentence which includes funds in transit in the Cash balance. Funds in transit should not be included in Cash and should be left in other balances such as Accounts Receivable. The Cash and Cash Equivalents details in the notes to the accounts should always be examined for details on the firm’s definition of Cash. Aggressive treatments include adding funds in transit, not deducting cheques written or including some accounts receivable. Inconveniently, a note on the firm’s definition of Cash is not a requirement and is not always available (Demand Media’s accounts filed in 2013 contain no Cash definition). The Cash balance is sometimes viewed in isolation. For example, analysts will sometimes deduct cash from a company’s market capitalization prior to calculating a Price/Earnings ratio. This assumes that the Cash balance is essentially a permanent asset of the company with no encumbrances. However, in many circumstances the cash in owed to customers. Groupon for example collects payments directly from purchasers of its ‘Groupons’ , in then pays a portion of these payments to the provider of the service approximately 3 months later. Thus a large portion of Groupon’s cash balance is pledged to service providers and will only remain with Groupon for 3 months. In Groupon’s 2012 10-K filing Cash and Cash Equivalents is $1.2bn and ‘Accrued Merchant and Supplier Payables’ is $670m. In addition Groupon includes refunds (ie amounts that must be repaid to purchasers when a merchant fails to fulfil its obligations) in Accrued Expenses. After deducting amounts payable Groupon’s cash balance is a mere $280m.